New statistics have shown the impact video games companies have on the UK, as well as indicating the size of the domestic industry. The findings come from the catchily-titled 'Screen Business: How tax incentives help power economic growth across the UK' report, produced by consultancy firms Oslberg SPI and Nordicity and commissioned by the BFI. In investigating the effect of tax reliefs across the screen industries - including film, TV, animation and video games - it also explores overall economic figures for those sectors. Screen Business uses 2016 statistics in order to ensure solid comparisons between industries, as some sectors are still calculating 2017 data. The report shows that in 2016, the video games industry contributed £2.87 billion to the UK economy, and supports the full-time equivalent jobs (FTEs) of 47,620 people - this is based on the amount of man hours spent working in the industry, where two people working part-time might count as the equivalent of one full-time job. Trade body UKIE, which helped source data for the report, tells GamesIndustry.biz these are record numbers for the UK games industry, with CEO Dr Jo Twist adding that they may help more people see development, publishing and the like as a valid career path. "Many might be surprised that the games industry contributed over 47,000 jobs, directly and indirectly, including over 16,000 in development and publishing roles, and the figures show that the creative ecosystem across our screen sectors is healthy and a critical part of the creative industries story in the UK - the fastest growing sector in the economy," she says. Broken down further, the number of people directly employed by the industry (e.g. development, publishing, retail) was reported as 20,430 FTEs, and contributing £1.52 billion. The higher number is reached when you factor in 'indirect' employees (i.e. those not linked to the production or sale of the game, such as media, PR, lawyers, office managers, cleaners and so on), as well as the 'induced' economic impact (i.e. the effects of all these people being paid and what they spend on). UKIE shared further statistics with GamesIndustry.biz, which show that the majority of the 20,430 FTEs is in development: 13,840 FTEs, in fact. Physical retail is the next largest area with 3,980, followed by publishing at 2,300. Digital retail only accounted for 310 FTEs, although it's worth reiterating that these are 2016 statistics, so this is likely to be much higher today. 17.3 per cent of all sales revenues generated over the year were actually spent on UK-developed games, such as Grand Theft Auto V and Forza Horizon 3. When looking at the Gross Added Value (GVA, the contribution to the UK economy), development once again made the biggest impact. From the £1.52 billion contributed, £826 million was attributed to development, £526.6 million to publishing, £132 million to physical retail and £31.7 million to digital retail. Combined, the direct economic impact of development and publishing came in at 16,140 FTEs and £1.33 billion. The report was also the first time the impact of the esports sector has been reported, with 470 FTEs and £18.4 million in GVA - and, again, this is likely to have increased significantly since 2016. In 2016, £1.25 billion was spent on developing games in the UK - by comparison, £1.72 billion was spent on film production - while £1.75 billion was invested into UK companies from overseas. Of the £1.25 billion spent on development, £389.9 million was support by video games tax relief - almost a third of the UK's total expenditure on making games. Projects that benefitted from tax relief also provided 9,240 jobs across the industry, including 4,320 FTEs specifically in development-related roles (31 per cent of the UK's entire development workforce). £45 million was paid out in tax relief over the course of 2016, and the success of games it helped to fund contributed £294.1 million to the UK economy. This rises to £525 million when you include indirect and spillover economic impacts - and the report states that 68 per cent of these games would not have been made without the help of this government incentive. Overall, these games generated £156 million in tax revenue, meaning for every £1 invested in the industry, the tax relief added another £4 to the UK economy. That's more than the £2.73 for each £1 generated by children's TV, but falls a little short of animation (£4.44), high-end TV (£6.10) and film (£7.69). However, video games far outstretches the other screen industries in terms of labour productivity (the average amount an employed individual contributes to the economy) at £83,000. All screen sectors' productivity rate came above the national average of £62,100. Video games also contributes at higher tax-supported GVA than animation and children's TV, which come in at £78 million and £355 million respectively. 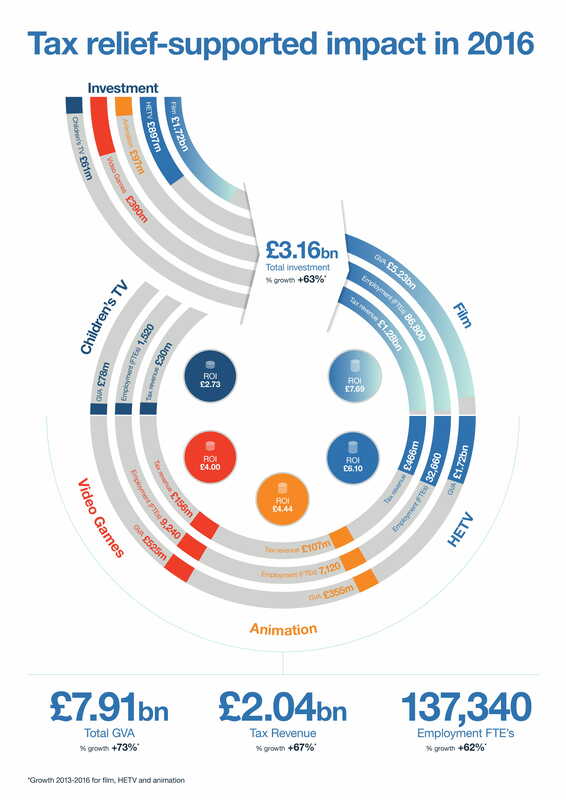 But TV and film are the clear leaders in this respect, at £1.72 billion and £5.23 billion respectively. When combined, tax relief helps the screen industries contribute £7.91 billion to the UK economy, generating £2.04 billion in tax revenue and supporting 137,340 FTEs. "The figures give clear evidence that VGTR has played a vital role in the continued growth of the UK games sector and in providing confidence and certainty to the market," Twist concludes. :"In 2016, VGTR supported 31 per cent of the total UK game development workforce and this shows what a positive impact it has on employment. We would encourage anyone developing games in the UK to look at how they can qualify for the relief. "VGTR is an increasingly important incentive providing confidence to the games industry and these figures show that it is delivering value back to the economy. It is vital to be able to demonstrate the positive impact of VGTR if we want the continued backing of the government."